Gentle next to skin, tough on stains. Suitable for sensitive skin. British Skin Foundation recognises Persil?s research into skin care. Helps remove stains like oil and Ribena. Works efficiently at lower temperatures. Have you tried the full Persil Non Bio range? Also available in liquid, capsules and powergems. Looking for a washing powder that?s gentle next to skin but tough on stains? Persil Non Bio Washing Powder is what you need. Persil Non bio powder is great for all the family. Persil?s skin care research is recognised by the British Skin Foundation, so you can be confident that this non biological washing powder will be kind to your clothes and gentle next to skin. 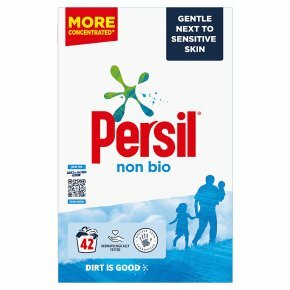 Its mild formula makes it the ideal detergent for washing baby clothes, so that everyone from new-borns to parents can benefit from Persil non bio powder?s gentle touch. Persil washing powder is designed to help tackle stubborn stains like oil and Ribena, even in a quick wash. It also provides great results at lower temperatures. With cooler, quicker washes, Persil non biological washing powder can help you save time and energy while still leaving your clothes fresh and clean. How to use: Use this Persil washing powder to remove stains and refresh your clothes with a gentle touch. Add the washing powder into the dispenser drawer (see pack for full dosing instructions) and check the care labels on your garments before selecting the appropriate wash cycle and temperature. This washing powder can be used for both machine washing and handwashing. If washing clothes by hand, follow the instructions on the pack and dissolve the washing powder completely in water. Always test the colourfastness of any new coloured clothes before laundering, and wash light, dark, and coloured clothing separately to avoid fading or colour run.